Citation Information: J Clin Invest. 2005;115(12):3494-3505. https://doi.org/10.1172/JCI26052. Activation of inflammatory pathways may contribute to the beginning and the progression of both atherosclerosis and type 2 diabetes. Here we report a novel interaction between insulin action and control of inflammation, resulting in glucose intolerance and vascular inflammation and amenable to therapeutic modulation. In insulin receptor heterozygous (Insr+/–) mice, we identified the deficiency of tissue inhibitor of metalloproteinase 3 (Timp3, an inhibitor of both TNF-α–converting enzyme [TACE] and MMPs) as a common bond between glucose intolerance and vascular inflammation. Among Insr+/– mice, those that develop diabetes have reduced Timp3 and increased TACE activity. Unchecked TACE activity causes an increase in levels of soluble TNF-α, which subsequently promotes diabetes and vascular inflammation. Double heterozygous Insr+/–Timp3+/– mice develop mild hyperglycemia and hyperinsulinemia at 3 months and overt glucose intolerance and hyperinsulinemia at 6 months. A therapeutic role for Timp3/TACE modulation is supported by the observation that pharmacological inhibition of TACE led to marked reduction of hyperglycemia and vascular inflammation in Insr+/– diabetic mice, as well as by the observation of increased insulin sensitivity in Tace+/– mice compared with WT mice. Our results suggest that an interplay between reduced insulin action and unchecked TACE activity promotes diabetes and vascular inflammation. 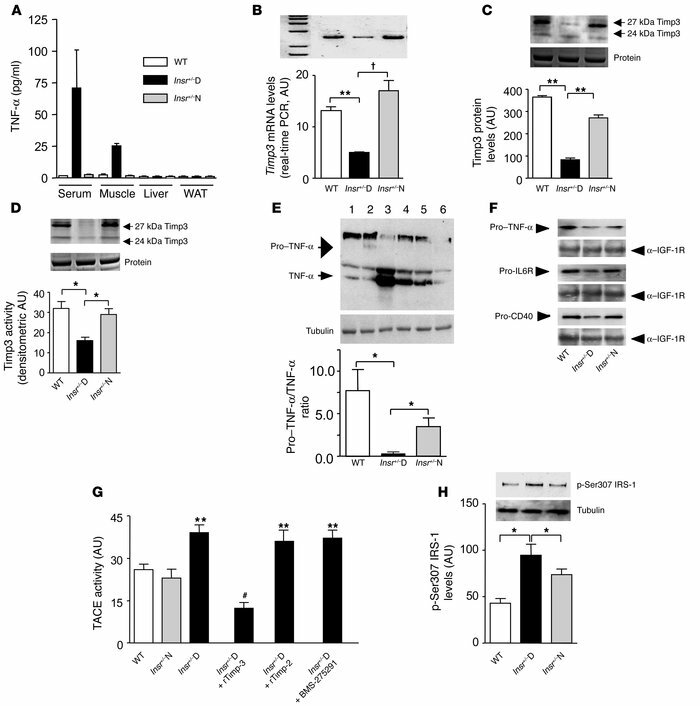 Timp3 expression and activity in skeletal muscle of Insr+/–mice. (A) Quantification of TNF-α in Insr+/–D, Insr+/–N, and WT littermates. (B) Real-time RT-PCR analysis of Timp3 mRNA expression in Insr+/–D, Insr+/–N, and WT mice. **P < 0.01; †P < 0.001 by 1-way ANOVA. (C) Western blot analysis of Timp3 protein expression in Insr+/–D, Insr+/–N, and WT mice (equal loading was confirmed by silver staining). **P < 0.01 by 1-way ANOVA. (D) Comparison of Timp3 activity, measured by reverse zymography in Insr+/–D, Insr+/–N, and WT mice (equal loading was confirmed by silver staining). *P < 0.05 by 1-way ANOVA. (E) Pro–TNF-α to TNF-α conversion in Insr+/–D (lanes 3 and 4), Insr+/–N (lanes 5 and 6), and WT (lanes 1 and 2) mice. *P < 0.05 by 1-way ANOVA. (F) Shedding of ProTNF-α, pro–IL-6R, and pro-CD40 in Insr+/–D, Insr+/–N, and WT mice. Gel loading was normalized by anti–IGF-1R. (G) TACE activity measured by a fluorimetric assay in Insr+/–D, Insr+/–N, and WT mice in the presence or absence of recombinant Timp3 (rTimp-3) (100 mM), recombinant Timp2 (rTimp-2) (100 mM), and specific MMP inhibitor BMS-275291 (1 μM). **P < 0.01 versus WT; #P < 0.01 versus Insr+/–D by 1-way ANOVA. (H) IRS-1 phosphorylation on Ser307 in Insr+/–D, Insr+/–N, and WT. *P < 0.05 by 1-way ANOVA. Data from 3 separate experiments are summarized in the bar graphs and expressed as mean ± SD.